This handsome Autism Cat Eye bracelet features white 8mm cats eye round beads that beautifully set off four red, yellow, blue and light blue beads at the center of the bracelet. The charms, spacers, clasp, jump ring and even the wire is .925 sterling silver. 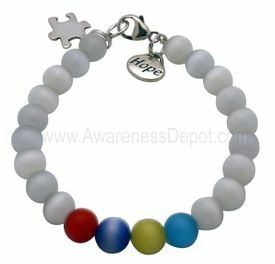 Features an Autism Puzzle Piece charm and a "Hope" charm. Custom bracelets sizes are available 6" to 7 3/4". Just put your desire bracelet size in the comment section. Kindly allow 7 days for custom size bracelets.